The Mozilla Foundation has released Firefox version 40 to its public channel for both desktop and Android devices. The milestone update includes a minor Windows 10-inspired UI update and expanded malware protection in addition to the usual batch of bug fixes. Mozilla said it has made “thoughtful” tweaks to the Firefox interface to give it a streamlined feel. Specifically, version 40 includes larger design elements – a larger “close” button on tabs and a bigger font in the address bar, for example – to make it easier to use with touchscreen devices on small screens. Following Mozilla’s public outcry to Microsoft regarding the Windows 10 upgrade process, it’s comes as little surprise to see the foundation address some of its qualms in the new version of Firefox. 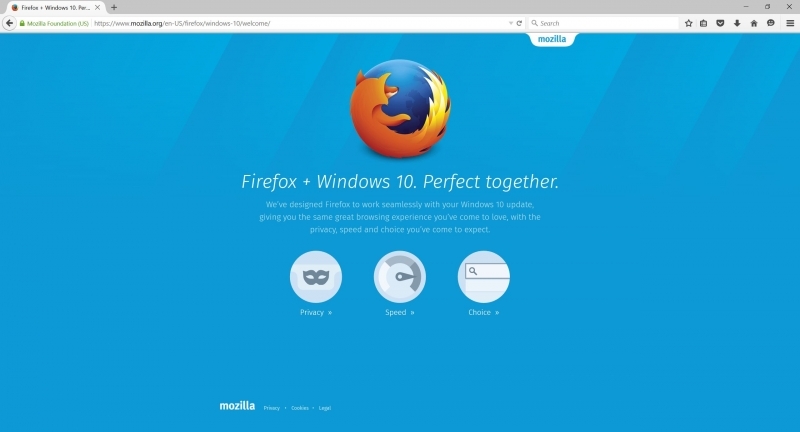 Mozilla has created some support material to help show users how to restore or select Firefox as their default browser in Windows 10. When using the search field on the Windows 10 taskbar to search the web, Firefox will display results from whichever search engine you select as your default instead of relying on Bing. Other browsers require third-party extensions to pull off the same task although that’s likely to change in the near future. New developments in Google’s Safe Browsing service now allow Firefox 40 to issue a warning if you’re about to navigate to a website known to contain malicious or deceptive software. You can download Firefox 40 simply by clicking here. Firefox F T W ! I hope many programs get updated versions for windows 10, so we can have a more cohesive UI and also it would be wonderful that programs start using the new notifications center, personally, I think is one of the great new features for windows 10.